I’m so excited to be starting a local Sip N Stitch in my Home town. Our first meeting starts this coming Monday Feb 5/18. I’ve designed a Crochet Granny Square Herringbone blanket to get us started! I thought it would be a great idea to come up with a few simple projects to work on while socializing. Of course you can bring along anything you’re working on but if you’re a beginner a Granny Square is a great place to start. There’s so many fun designs that can be made with these simple squares. A 2 tone granny triangle is perfect for making fun geometric patterns. To start with I’m working on a classic Herringbone design for my son. This blanket will fit a twin size bed or double as a nice large throw. Bulky & Quick designs are so cozy and definitely a favourite of mine. I doubled up a good old fashioned worsted weight acrylic yarn that will handle lots of love and washing. The yarn I’ve chosen is Bernat Super Value that I picked up at my local Michael’s store. Buy 2 get one free just happened to be the promotion. Good thing because I loaded the cart! At this point I’m not sure how much yarn I’m going to need but I’ll update this post when I have my blanket complete. To start I picked up 4 skeins of True Grey and 4 skeins of White. Each skien has 426 yards so I have a total of 3408 yards. In the pic above you’ll see I also purchased Loops & Threads Impeccable. I’ve designed an aztec style pattern for my daughter that I’ll work on after I finish up this design. These were her colour choices and I’m a little in love already! 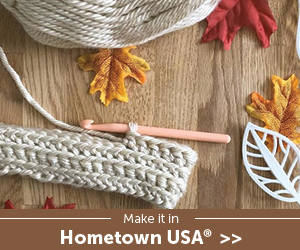 Be sure to grab those centre pulls so you don’t get a tangled mess when making this blanket! The blanket is 10 squares wide and 14 squares in length for a grand total of 140 squares! Each Square measures 5.5″ x 5.5″ so the herringbone blanket will measure Approx. 55″ x 77″. It seems intimidating to make all those squares but they’re super easy to work on while watching TV or socializing with friends. Once you get all these beauties made its time to start sewing them together. This may not sound appealing but it really is a simple task and one that can be done while gabbing and drinking coffee. I’m thinking I just might recruit my mom for this job because she doesn’t crochet but would really like to join my Sip N Stitch! Below is the graph you will need to follow to get a twin size blanket. If a larger blanket is desired just add additional width and length as needed. For width add by 2’s (add 2 centre columns). I wanted to get this posted even though I haven’t yet completed this blanket. I’d love you to crochet along with us even it you can’t be part of my group. Post your finished blanket pics to my FB page, tag mjsoffthehook or email us! Squares are made holding 2 strands of yarn together with an 8mm (L) crochet hook. Make 140 Granny Squares. Arrange per diagram above. Whip stitch squares together. Round 1: With MC, Magic Circle (adjustable ring) Ch 3 (counts as dc now and throughout), work 2 dc in ring, ch 2, work 3 dc in ring, ch 1, change to CC pull through loop on hook, work 3 dc, ch 2, work 3 dc, ch 2, pull ring tight, sl st to top of beg ch 3 to join, turn. Round 2: Sl st in ch-2 sp, ch 3, work 1 dc in ch-2 sp, work 1 dc in next 3 sts, work (2 dc, ch 2, 2 dc) in ch-2 sp, work 1 dc in next 3 sts, work 2 dc in ch-2 sp, ch 1, change to MC, work 2 dc in ch-2 sp, work 1 dc in next 3 sts, work (2 dc, ch 2, 2 dc) in ch-2 sp, work 1 dc in next 3 sts, work (2 dc, ch 2) in ch-2 sp, sl st to top of beg ch 3 to join, turn. Round 3: Sl st in ch-2 sp, ch 3, work 1 dc in ch-2 sp, work 1 dc in next 7 sts, work (2 dc, ch 2, 2 dc) in ch-2 sp, work 1 dc in next 7 sts, work 2 dc in ch-2 sp, ch 1, change to CC, work 2 dc in ch-2 sp, work 1 dc in next 7 sts, work (2 dc, ch 2, 2 dc) in ch-2 sp, work 1 dc in next 7 sts, work (2 dc, ch 2) in ch-2 sp, sl st to top of beg ch 3 to join, Fasten off and weave in ends. I hope you enjoy this new pattern!